Shanghai is the biggest city in China and one of the world's largest cities. It had about 24,000,000 people in 2017. It is so big and important that it is a special province-level city ("municipality"), like Beijing, Tianjin, and Chongqing. Right now, it is the biggest port in the world. The Mandarin Chinese name of Shanghai is Shànghǎi,[a] which is written as 上海 in Chinese characters. This name means "On-the-Sea" because Shanghai used to be next to the East China Sea. Today, dirt from the Yangtze River has made Pudong much bigger and downtown Shanghai is about 40 kilometers (25 mi) from the open sea. The city has become so big, though, that its government now controls other areas like Pudong and Fengxian that are still beside the sea. Shanghai's name is a little simpler than most other Chinese cities' names, because it was a small fishing village for a long time. The short way to say its name in Chinese is still Hù[a] (沪). A hu was an old kind of fishing trap that was made with bamboo and nets. The people around Shanghai used to use them to catch fish and crabs in Suzhou Creek and other waterways. Shanghai is at the mouth of the Yangtze River, where it meets the East China Sea in the middle of China's east coast. Downtown Shanghai is located just south of the place where Suzhou Creek meets the Huangpu River. This is about 20 kilometers (12 mi) southwest of where the Huangpu meets the Yangtze River. The area between downtown and the Yangtze used to be farmland and other cities like Wusong and Baoshan, but now Shanghai is so big that they are part of it. For most of China's history, Shanghai was a small fishing village. The big cities nearby were Suzhou and Hangzhou. Under the Ming and Qing, Shanghai had a big city wall and started to grow. Under the Ming and the Qing, people from other countries could only buy and sell things with China on an island near Guangzhou. The British began selling Indian drugs to pay for all the tea and other things they were buying from China. In the 1840s, China tried to stop them and the British started a war. To keep them from hurting Nanjing, the Chinese agreed to let them keep selling drugs. They also let the British start buying and selling things at four other cities, including Shanghai. Soon, parts of Shanghai were controlled by the UK, the US, and France. This control was ended by the Japanese during World War II. The Chinese Communist Party was founded in Shanghai. Shanghai is home to the China Stock Exchange, along with Shenzhen, and is the financial center of China. ↑ 1.0 1.1 These marks show the tones of the Chinese words, which are important in saying them correctly. 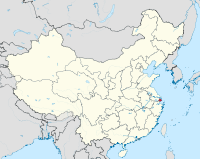 Wikimedia Commons has media related to Shanghai.